There’s one piece of equipment for parenthood that I feel like is often overlooked: the diaper bag. When my husband and I registered for the first time, we each naively added our own diaper bags. We chose a popular brand but didn’t think much about what we might really need, and I added the pattern I thought was cutest. Well, flash forward a few weeks with our new bundle of joy, and my husband’s diaper bag lay in the closet unused, and I was in Ross looking at a replacement one because the one I chose was too structured/stuff, and didn’t allow me to stuff it full of things I actually needed. I used to scoff at women who boug ht $500 diaper bags – but now, I get it. I spend money on a decent purse, and it’s worth it – because you can really feel that quality. 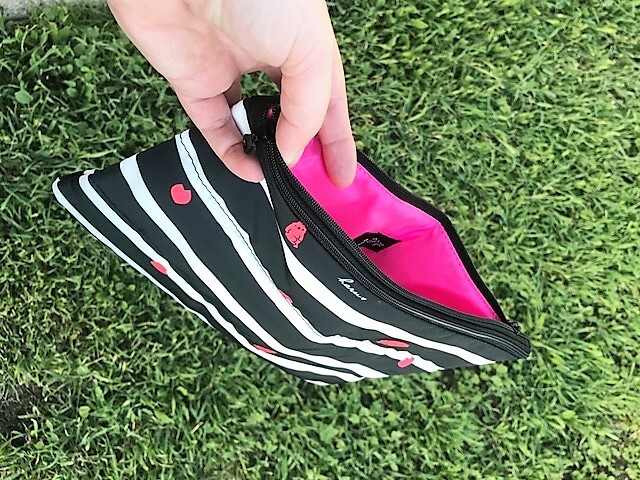 So I jumped at the chance to try a Haruhonpo bag last year, and was quickly enamored with the vivid print and soft structure, and bazillion hidden storage pockets – and even a place to stash wet things! 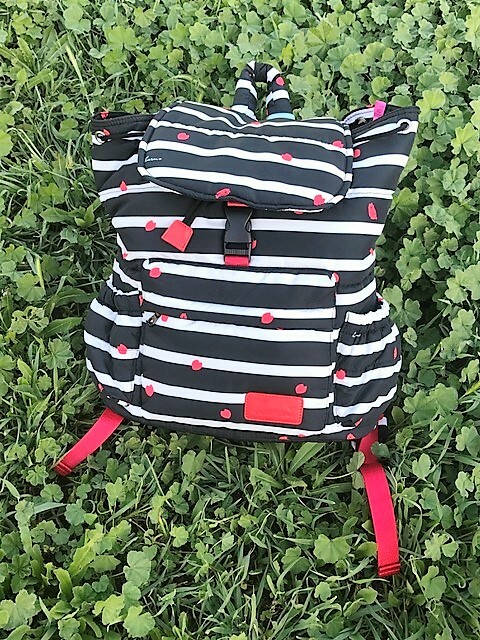 This year, I had the opportunity to try out a new print from Haruhonpo – the Sakura Top Cover backpack ($170), which is black and white stripes with cute red/magenta heart/cherry blossom prints and these random little gummy bear guys (which I love!). 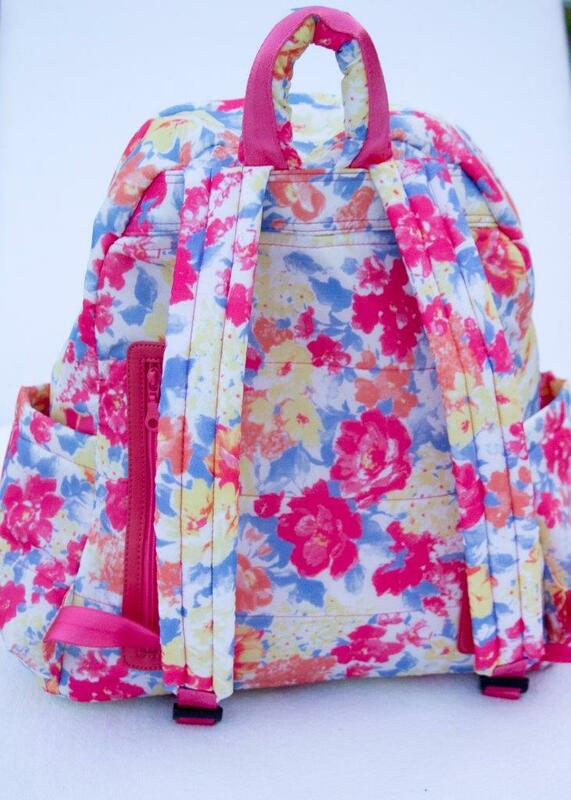 Recently, I had a friend over and she gushed, “I LOVE your backpack!” and was surprised when I told her it’s actually a diaper bag! 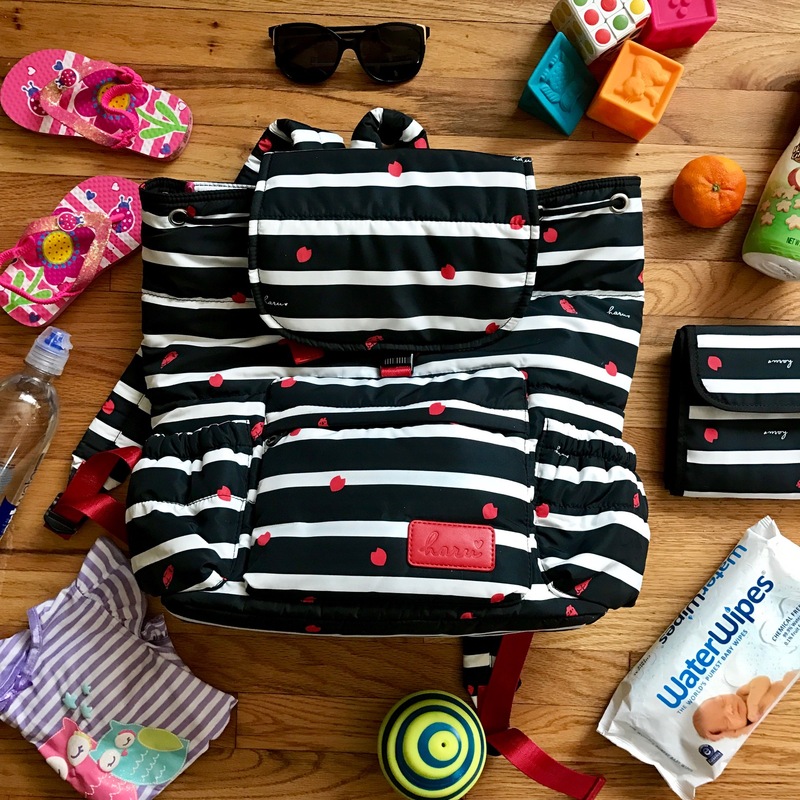 Now that Holly is a toddler, our diaper bag has turned into more of a “snack – sippy cup – toy- extra outfit” bag, with a few diapers and wipes. We also have to have ten million of those dang pacifiers, even though we’re working on breaking the habit, but when she loses it, the pacifier comes in handy. What I love about the Haruhonpo is that it comes with TONS of additional storage pouches. I use one for pacifiers, one for actual diapers/wipes, and one for raisins/pouches/crackers. They even have a double-zip seam for extra security and storage. The other great thing about this style of backpack is you don’t have to wrestle with carrying something on your arms when you’ve got baby + grocery bags+ your own purse on the others. 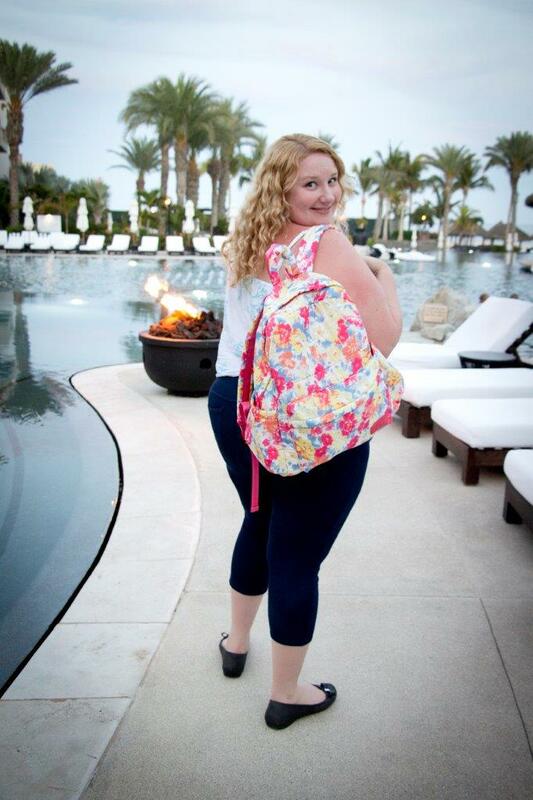 That’s where a backpack diaper bag comes in so handy. 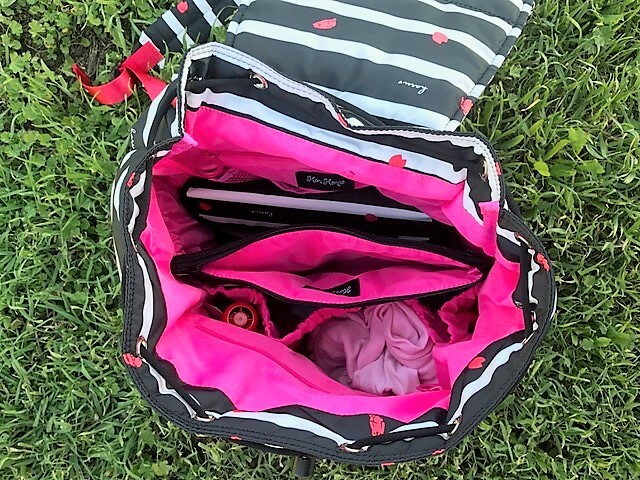 I really like a backpack style diaper bag for fun family outings like going to the zoo. Oh! One more thing. The backpack has two stretchy sleeves on either side for bottles/ and or/ sippy cups, which I think is SO important for easy access. You know your kid throws that sippy cup everywhere, so being able to grab it but keep it where you can easily give it back is priceless. 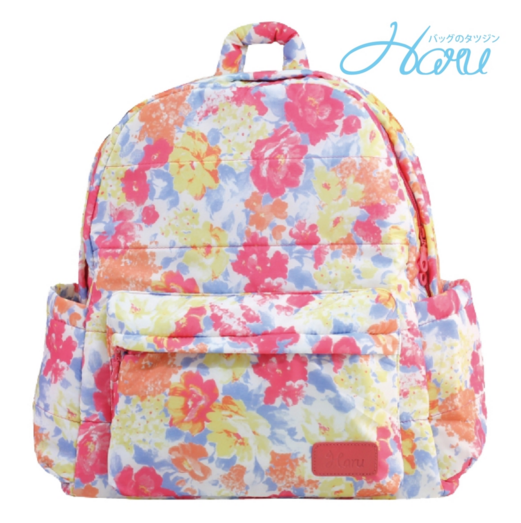 Haruhonpo has got Mommy n’ Me style on lock, because they offer kid sized backpacks that match! How cute, right? When Holly is bigger, I think I have to get her a matching one! Super light but big capacity, only weighs 1lbs. 13 storage compartment to store different type of baby items for easy access. Comes with folding changing pad! The insulated bag is fantastic for storing milk and not having to worry too much about it getting warm. If you’re a new mama or mama to be, I highly recommend checking out Haruhonpo. You can buy them at HaruhonpoUSA.com, and they’re now on Diapers.com and Nordstrom.com, too! 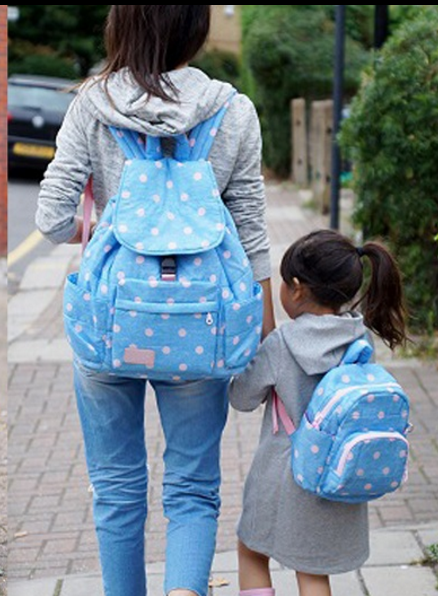 Which diaper bag has your heart?